An alternative is to use a p-channel MOSFET, which switches on if the gate has a voltage about 2V lower than the source (see the schematics below). Vcc is low when the rad1o is off and higher when it is on, which is the opposite of what we need. 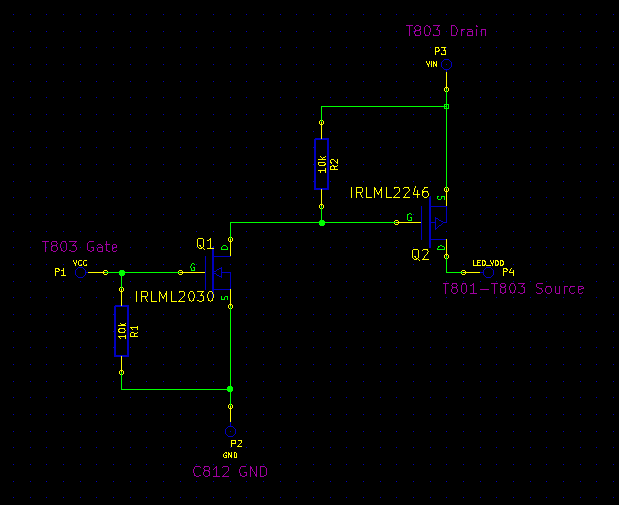 So an additional n-channel MOSFET is used to drive the gate of the p-channel MOSFET. The resistors ensure that the MOSFETs are switched off when they are not driven. I built it very small using 1mm pitch contact strip, MOSFETs with SOT-23 footprint and 0805 resistors vertically on the gate contacts (see picture). You should be able to use logic-level MOSFETs in bigger packages, as long as the p-channel MOSFET is able to carry the maximal current of about 500mA (almost all can, but for example not the somewhat popular BS250). The resistor values are not critical, anything between 1k and 100k should do.